We’re getting very close to the introduction of Apple’s new iPhones for 2018, and of course they’re certain to be powered by a new Apple-designed custom system-on-chip (SoC). In carrying on from past naming conventions, it will almost certainly be called the A12, along with a colorful descriptor (as in the “A10 Fusion” or “A11 Bionic”). By taking a look at the improvements made in previous Apple-designed SoCs and projecting forward to the current state-of-the-art in manufacturing technology, we can get a pretty good idea of what to expect from the A12. Apple has been very secretive about its upcoming processor, so there’s precious little solid information out there. Call this article an educated guess. The A11 Bionic found in the iPhone 8, 8 Plus, and X is produced using TSMC’s 10nm manufacturing process. The A12 will be produced with TSMC’s 7nm process—in fact, it should be the first widely-available consumer product made with a 7nm process, anywhere. You can’t compare the “nanometer” measurements of manufacturing processes from different companies, because each measures different facets of the chip differently to arrive at that number. But since Apple is sticking with TSMC to manufacture the A12, we can look at TSMC’s own guidance for a hint of how much better this new process is. In other words, if Apple were to produce the exact same A11 Bionic chip with the 7nm process, it could be roughly 40 percent smaller, and use either 40 percent less power running at the same speed, or run at a 20 percent higher clock speed at the same power. You can be assured those are best-case figures. Of course, Apple isn’t simply going to take the A11 Bionic and shrink it, it’s going to produce a more advanced and complex chip. Where the A11 had an impressive 4.3 billion transistors, we estimate the A12’s transistor count will fall somewhere between 5.5 and 6 billion. The A11 Bionic is powered by two high-performance CPU cores (code-named “Monsoon”) that run at a maximum clock speed of about 2.39GHz. It is paired up with four smaller, lower-performance and energy efficient cores (code-named “Minstral”). We would guess that the A12 is likely to stick with two high-performance cores, using the higher transistor count to improve performance and efficiency. 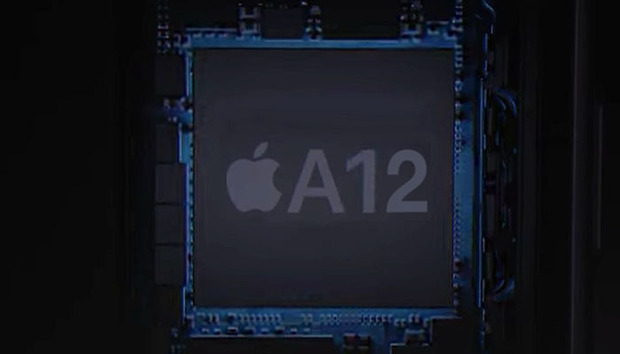 We don’t expect a big increase in clock speed: the A12 is going to be a big and powerful chip, so there probably won’t be enough headroom to push it past around 2.5GHz or so in an iPhone-sized device. Here's a look at the Geekbench 4 single-core scores for the last several generations of A-series processors. The improvement over the last four generations is very linear, and we expect a similar improvement this year. The single-core Geekbench 4 score of a phone with the new A12 in it is likely to be around 5,000, give or take 100 points or so. Single-core performance has improved at a very regular rate over the last several years, and we expect it to continue this year. Apple is likely to stick with four energy-efficient cores, again making a few minor architectural tweaks and adjustments to improve energy efficiency and performance. On the CPU side, our prediction is that the A12 will stick with a six-core design (two big, four little) that offers roughly 20 percent better single-thread performance and 20 to 30 percent better multi-core performance. 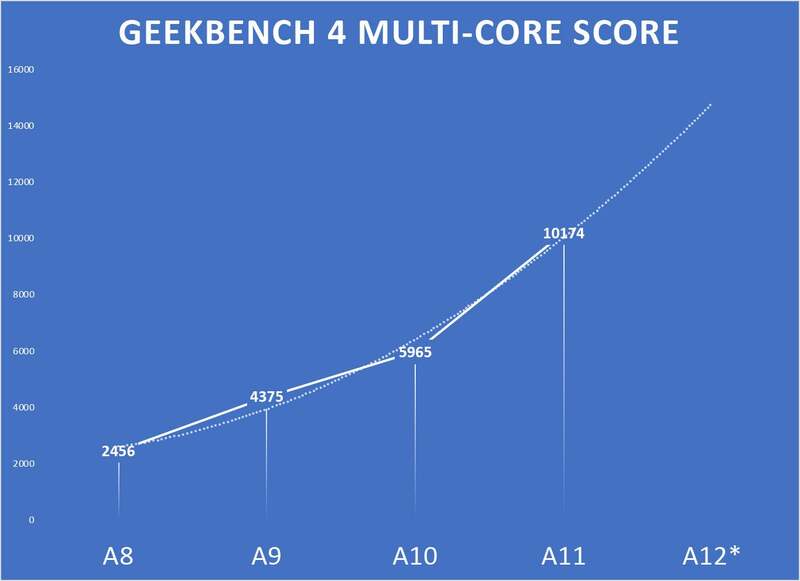 Using past Geekbench 4 multi-core test scores and projecting forward with a trendline to the A12 shows a score of around 15,000, but we don't expect that to actually come to fruition. 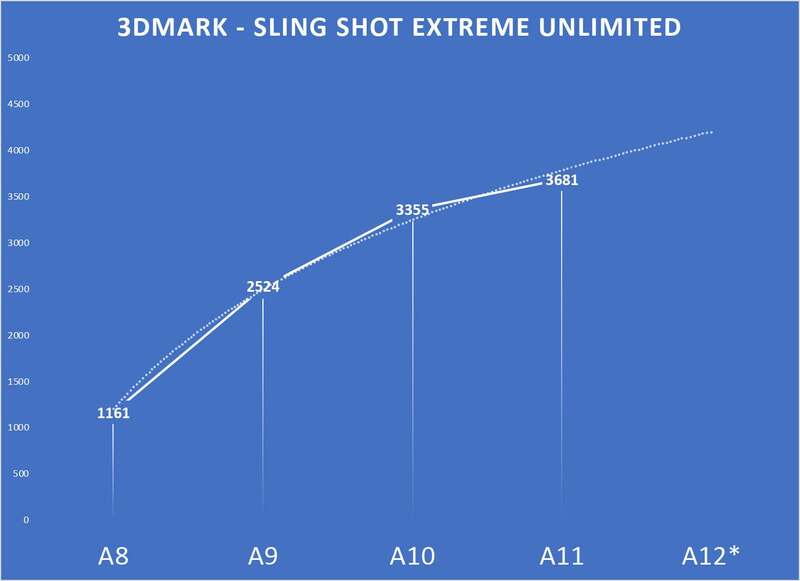 The A11 delivered a huge improvement to multi-core performance, but the A12 won't be able to match the trendline. Why? Because the A11 made a major architectural change to the way multi-threaded performance works. It introduced a new second-generation performance controller that, for the first time, allowed the two big cores and the four little cores to all work at the same time. That had a huge impact on multi-core performance. The A12 may have faster cores, and may even be more efficient about using them all at once, but it won't have the advantage of suddenly being able to use more of them at the same time than ever before. What about the graphics processor? The A11 Bionic featured an all-new three-core graphics chip designed by Apple, rather than the PowerVR-designed GPUs in previous Apple processors. The A12 will probably add a fourth core and slightly improve the architecture, for a roughly 40 percent improvement in graphics performance. Here are 3DMark scores for the last four iPhone releases, using the Sling Shot Extreme Unlimited test. Performance is tapering off a little, and the trendline tells us that we can expect a score of roughly 4200 in this test in the A12. Real-world graphics performance is starting to platau in iPhones. Why are real-time graphics benchmarks like 3DMark showing less improvement over time? This probably has to do with memory bandwidth: real-time graphics for games are memory intensive, and once you've reached the limit of your ability to read and write data from RAM (and various caches), it doesn't matter how much faster your GPU is. The A12 may have slightly faster RAM, but unless it adds memory channels to dramatically improve memory bandwidth (which we don't expect), it's not going to deliver a massive increase in gaming performance. Let's look at the GPU's performance in computational applications, using the Apple's Metal framework. 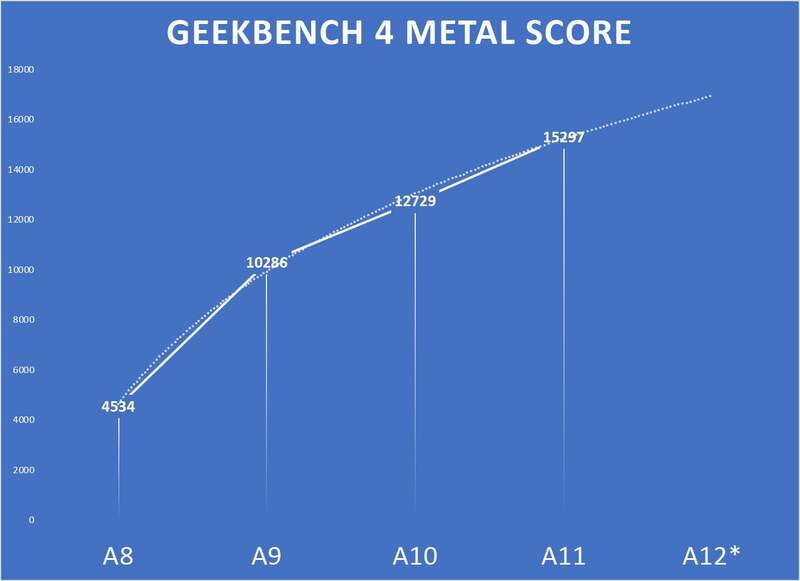 Geekbench 4's Metal tests show steady improvement over the years, less encumbered by memory bandwidth than the gaming graphics of 3DMark. For the last two generations, Apple's GPU compute performance has gotten 20% better as measured by Geekbench. This is a trend we think will continue, with the A12 delivering another 20 to 25 percent real-world Metal compute performance over the A11. That's a score of about 18,500, give or take a few hundred points. Note that Apple frequently promotes its GPU as being significantly faster than what the benchmarks show. The company claimed the A11 had a GPU that was 30 percent faster than the A10. That may be true in some limited circumstances, but most benchmarks showed improvements in the 15 to 25 percent range. Apple will likely claim a performance improvement of 30 40 percent, with real-world benchmarks showing less. Today’s mobile processors are more than just a CPU and graphics processor. They feature hardware dedicated to audio processing, processing data from the motion and other sensors, image processing from the cameras, and now even machine learning. These are some of the most difficult aspects to know the performance of, because they’re often highly proprietary, dedicated to specific tasks, and because Apple is very secretive about them. 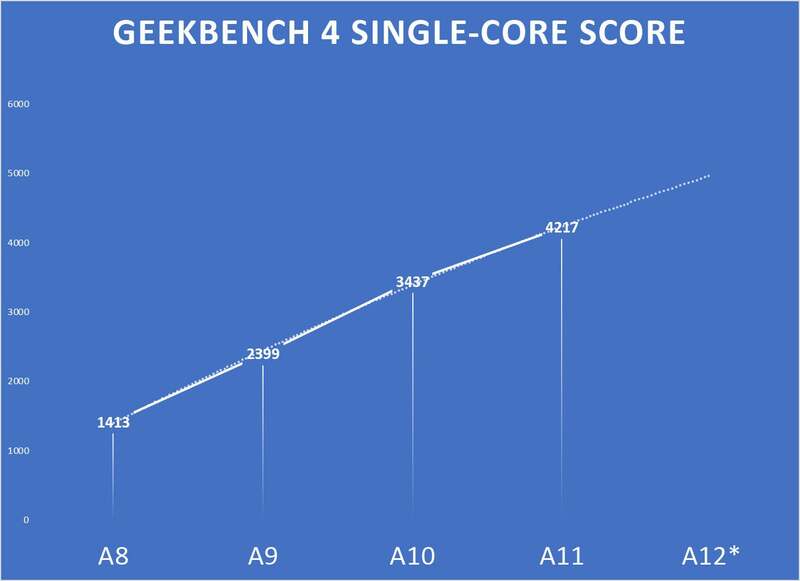 The A11 Bionic delivered Apple's first dedicated machine learning hardware, and the A12 will likely deliver a big improvement. The A11 was the first of Apple’s chips to have hardware dedicated specifially to machine learning, which it called the “Neural Engine.” The A11’s Neural Engine was capable of 600 billion operations per second, and it’s highly likely that Apple will invest more heavily into this sort of hardware as time goes on. 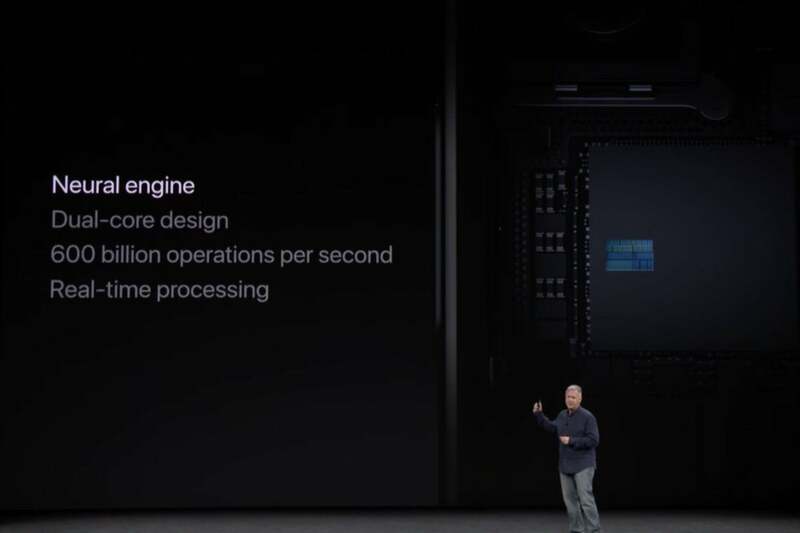 It would be quite surprising if the Neural Engine in the A12 was capable of less than 1 trillion operations per second, and you can expect Apple to call out such an impressive-sounding number on stage. It might even be 1.2 trillion or more—twice the machine-learning number crunching power of the A11. The ISP (image signal processor) inside Apple’s chips get more powerful every year, and it plays a huge part of the improved camera quality we always expect from a new iPhone. This year will be no different, though it’s hard to put a figure on exactly how much more powerful the image processor and video encoding hardware will be. The iPhone 8 and X can already do 1080p slo-mo at an impressive 240fps, and 4K video at 60fps. Doing more than that is as much about moving data off the imaging sensor as it is about the image processor performance. So, expect a faster and more powerful ISP for improved photo and video quality, but not necessarily faster slow-motion performance. The move from a 10nm manufacturing process to a 7nm process would mean better battery life if Apple used the same chip design at the same speed. However, Apple is almost certainly going to make a more powerful and complex chip, mitigating most of that reduction in power draw. What’s more, real-world battery life is the result of a host of factors like the efficiency of the cellular and Wi-Fi radios, the display, and storage. Still, the idle power states of the A12 should be impressively low, so we wouldn’t be at all surprised to see less battery drain when the new iPhones are asleep. The power draw when running intensive applications and games will probably not be dramatically different—at least, not from the system-on-chip. Apple is essentially at the threshold of how much heat can be dissipated in an iPhone’s compact size. In other words, the “screen on time” battery life of the new iPhones will be as much about the battery capacity, display efficiency, and radio efficiency as it will be about the A12. But we’ll go out on a limb and say that idle battery life (already a strong suit of iPhones) is going to be killer, and that the presumably larger battery in the new Plus sized iPhone will give it a real advantage over this year’s iPhone X. A more efficient cellular radio should improve battery life, too. Thought it’s not really part of the A12 system-on-chip, this is probably a good time to mention another important aspect of the new iPhone’s hardware: wireless performance. The rumor mill says that Apple is going to drop Qualcomm as one of its modem suppliers, instead going with Intel’s modems on all its iPhones. While Qualcomm makes superior modems today, the same may not be true of the modems in question for this year’s iPhones. If you’re hoping for Apple to pull a rabbit out of its hat and be the first to sell a mass-market 5G smartphone, keep wishing. The modems aren’t really ready yet, the networks are not built out, and there hasn’t been enough time to test the technology. What’s more, the new frequencies used in 5G cellular will require new antennas that may require different phone designs to properly implement. So don’t expect a 5G iPhone until at least 2019 or maybe even 2020. The figures in this article have all been taking from the iPhone implementations of Apple's chips. The A10, for example, uses performance numbers from the iPhone 7 Plus rather than the new iPad introduced this spring. If Apple introduces new iPad Pros this September, as we expect it to, there are two likely scenarios for their processor specs. The first is for them to use the same A12 as found in the iPhones, but running at a higher clock speed and maybe faster memory, too. The larger size of the iPads lets them dissipate heat more effectively, and the much larger battery helps with the increased power draw. If this is the case, you can add another 15 to 20 percent to the projected performance of the A12. The other option is for Apple to introduce an A12X chip along with the new iPads. This is unusual, but not unheard of: In 2015, Apple introduced the iPhone 6s with the new A9 processor along with the new 12.9-inch iPad Pro with the A9X. If Apple follows this path again, the A12X would be a beast of a tablet chip. Take the A12 and add one or two more high-performance cores, and you've got a chip that would put Intel's latest ultra-low power laptop chips to shame.